Originally published in 1976, this fourth and final volume in a series that met with critical acclaim is concerned with a certain kind of answer to the question "What distinguishes the concepts that are a natural part of human languages from those that are merely expressible in language?" The kind of answers contemplated rely on formal properties of the logics that overlay the two sorts of concepts. The author presents a substantive theory of natural concepts which helps to make concrete the methodological proposals. In order to make the theory more manageable, it is restricted to sentential modifiers expressed in English. Although these proposals are substantive, the methodology they exemplify may be of even more significance. Some of the ideas in the author’s approach derive from the work of Chomsky, and several issues relevant to the growth of logical thinking are also treated with data that speak to questions raised in Volume 3, concerning qualitative change through development. 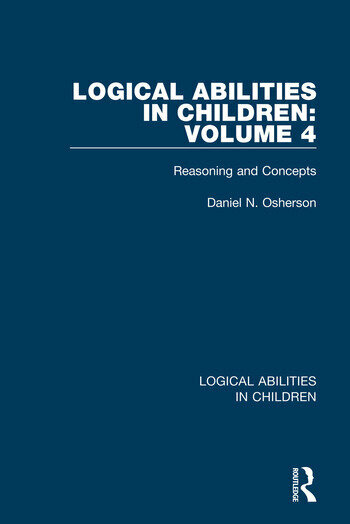 This final volume in the series will be essential reading for all concerned with both logical abilities in children, their development, and novel methodological approaches to research bearing on this and related issues. Preface. Part 1: Introduction 1. Two Leftovers from Volume 3 2. Some Methodological Issues 3. A Deduction Model for Quantifiers Part 2: Experimental Test of Mq, and the Question of Developmental Change 4. Experiment 1: Test of Mq with Adolescent Subjects 5. Experiment 2: Test of Mq with Child Subjects 6. Experiment 3: Test of the Model with Arguments Based on Time 7. Experiment 4: Test of Mt with Child Subjects Part 3: Explanatory Adequacy of Deduction Models 8. Explanatory Adequecy: General Considerations 9. Proposals for a Theory of Conceptual Domains Part 4: An Initial Test of the Theory 10. A Deduction Model for the Conceptual Domain of Necessity and Possibility 11. A Deduction Model for the Conceptual Domain of Obligation and Permissibility. Epilogue. Appendix Richard F. Poppen. References. Author Index. Subject Index.